I suffered for years from depressions, both mild ones and serious ones. I didn’t start doing NVC in order to overcome my depressions, but after some time doing it, I noticed that my mental health improved tremendously. Let me know in the comments how you are dealing with being depressed. Did NVC help you? Thank you, Marianne. I teach NVC in Wyoming, USA and really enjoyed the simplicity, clarity and vulnerability with which you shared your story and how you work with NVC. I feel grateful to have the beautiful resource of your offerings to share with others, as well as inspired by them myself. Warmth and gratitude to you, and wishes for all good things! Thank you Marilyn, feel warm to receive this! Wow yes! Thanks for speaking about this….I’d like to acknowledge that I have been struggling with depression for many years now and NVC has really supported me over time and I can now see that there is life in there wanting to be lived. I specially appreciate the part about self-care, it moved me because I am having a hard time understanding what this rift is about between me and a friend and I so enjoyed the reminder how my honesty can be a gift to the other person and of course to myself. Hi Annie, touched to read what you share about your experience with depression…And I wish you lots of luck with your friend. Thank you for sharing this video. Your story made me feel encouraged about my own struggle with depression. I’m new to NVC but very quickly thought that this would help me change my relationship with myself. Thanks again. Hi Kelana, happy to hear it’s encouraging for you. I want to send you a hug and lots of good vibes for your journey. i cried a bit listening to you talk. – thank you for sharing, it was very powerful to hear. i find it very hard to practice nvc (towards myself or towards others) when i am in a deeper depression. i think it’s like exercise for the brain – you know physical exercise and empathy are both good and important and helpful but when you are depressed you don’t really even want to feel good. how do you get past that? 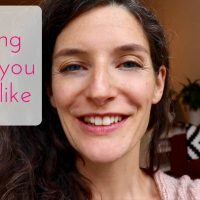 Just from reading this, it’s hard for me to say what would be good for your unique being, but I will give it a try anyway:-) From hearing that sometimes you don’t want to feel good, I get curious. I wonder if that could be a place of starting to explore. What could happen when you ‘feel good’ that frightens you or doesn’t seem appealing? I can imagine you might like support in this exploration. Sometimes our thoughts seem (seem!) so true we need a trusted empathic other person that can help us untangle the stuff that our brain thinks. This could be an NVC trainer or psychologist or whatever is your preference. Im curious how this sounds? Hi Marianne, thank you for your videos! NVC is such a beautiful way to communicate and listen. I am a Holistic Nutritionist and I am creating a Program for Moms with Depression. I am including food information of course, but also exercise, mindfulness and NVC. Also, you have helped me connect with my 4 year old son! He can get into a negative mood quickly. Depending on how I respond he jumps out of it or goes deeper into the negativity. I am so grateful to have the tools and techniques that you have shared to help me respond to him in a way that allows him to come back to himself. Thank you for your sharing and vulnerability!!! Hi Morghan, wow im so thrilled that there will be this program for mums. If you like you can put a link to it in the reply, so my mom readers can find it. Marianne I felt deeply touched by your presentation (tears). I send imaginary benevolent energy ~ wind under your wings ~ as you grow in NVC. I appreciate how you learn as you go on Youtube, and am inspired witnessing your honesty, genuineness, kind heart, aliveness and your wish to connect others in NVC. I support you wholeheartedly. Keep going. The videos get better and better. Hi Marianne, thank for sharing yourself on this really vulnerable topic. I think this really brave and it touches me and makes me sad and happy for the same time, since I wish all people could connect through seeing and expressing their feelings! I have dealt with depression for a couple of years and I am turning to NVC right now in my life since I noticed how it absolutely fits to my current values and everything I have learned in my therapy to become a more healthier beeing and full of joyful life. That is (amongst others): self-empathy, appreciation (of even the tiniest things in yourself, others and the world), and trying to avoid evaluative thinking and speaking. I am working as a kindergarten teacher, now, and I am using NVC there to to connect to the children and to avoid any kind of punitive actions. Your videos on NVC with kids also helped a lot!